You can drop passengers off at the Departures level at T1 International. To help keep this zone congestion free and ensure other passengers get to their flights on time, we ask that you stop for no more than one minute. To help keep the airport safe and secure, you must remain with your vehicle and only use this area to drop off passengers. If you're dropping off disabled passengers, clearly signed designated areas are available in the passenger drop off zones. Please note that drivers must remain with the vehicle at all times. If your passenger needs assistance accessing the terminal, we recommend an additional person attends to assist while you remain with the car. To reduce congestion and ensure that other passengers get to their flights on time, we ask that you stop for no more than five minutes in these areas. 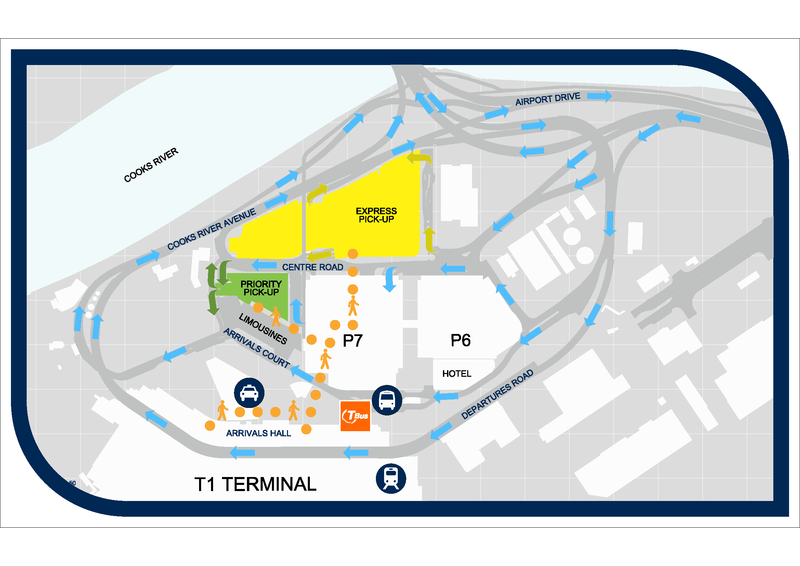 Less than two minutes’ walk from the T1 International terminal, our most convenient public pick-up zone. Directions for arriving passengers: Follow the green Priority Pick-up signage after exiting the Arrivals Hall. Directions for drivers: Follow the green Priority Pick-up signage as you enter the International precinct. Note that all parking payments for Priority Pick-up are made via your e-Tag, charged as you exit the zone. No cash or credit card payments are accepted at Priority Pick-up. If you don’t have an e-Tag, you should choose Express Pick-up (15 minutes’ free parking, charges apply for longer stays) or the P7 multi-storey car park. These rates are charged automatically to your e-TAG as you exit the zone. Directions for arriving passengers: Follow the yellow Express Pick-up signage after exiting the Arrivals Hall. Directions for drivers: Follow the yellow Express Pick-up signage as you enter the International precinct. Directions for drivers: If you’re coming along the M5 heading east, look out for the Blu Emu Car Park sign on the left. Turn left into Butler Road at the BP service station. If you’re coming from the Domestic precinct, you can access Blu Emu Car Park via Ross Smith Avenue - look out for the signage. Accessible pick up spaces are available on the Arrivals level. There are 2 set down spaces with wheelchair ramps. Drivers must remain with their vehicle at all times.